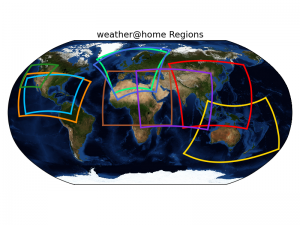 It has been a long time coming but finally our newest models, weather@home2, can also be run on macs as well as linux and windows operating systems. We would like to thank all mac using participants for their patience and hope that you will enthusiastically move away from Australia only simulations to help us simulate all other weather@home regions. Overview of all currently available weather@home regions.